I guess I am still not late for TF entry. Here it is! fresh from our garden today. As I was watering the plants and flowers in our garden today, I found this very beautiful creature trying to enjoy its stay on the Early Sunrise flowers. It is also called Coreopsis Grandiflora, also known in German as Maedchenauge. I love the butterly and the flower here..such a beauty of nature! take care guys! I hope to visit you soon! 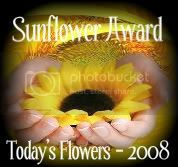 Click the logo...feel free to join and see the beauty of flowers from all over the world. Special appreciation to Luiz and the TF team for this very wonderful meme. Happy TF day! I love that cute butterfly in the flower..
What a glorious flower! And the lovely visitor fits perfectly! Great shot! Fantastic shot. The butterfly seems to like it too. I have one in my post too. it sure very stunning! agiagi lang Rubz muaaah! Oh yeah- sorry diay ha...promise this week. Happy Monday and enjoy your week. love your golden flower and you cute butterfly. Beautiful flowers, and lovely butterfly, even if he has been damaged! At least he is still moving, rather than being breakfast for someone! I combined my Mellow Yellow and Today's Flower posts with Scenic Sunday at Sacred Ruminations this week.